Get & Download Sims 4 Cheats Codes below. 1 Get & Download Sims 4 Cheats Codes below. Enjoy Sims features and lot more by applying Sims 4 cheats and codes. The first thing you guys are gonna want to do and this should work for PlayStation as well, Hold both triggers and bumpers together.This should open a little text box in the top left corner. The first thing you guys have to do is to type testingcheats true and press OK. We have the best collection of sims 4 cheat codes. 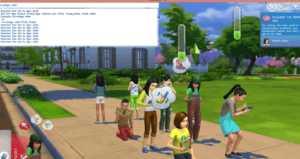 Check The Sims 4 UI Cheats here. Statistic_skill_toddler_potty X – Caps at 3! resetsim firstname lastname Resets a stuck Sim back to the home lot. sims.remove_all_buffs Removes all moodlets from your Sim.Positive ones (such as high needs/environment) will come back. freerealestate on/off Makes homes free. fps on/off Display the game's frames per second, useful for graphics settings. household.autopay_bills Disable or enable bills for the household. hovereffects on/off Disable hover effect when you mouse-over a Sim. bb.showhiddenobjects Lets you buy many hidden objects. bb.ignoregameplay unlocksentitlement Lets you buy items locked by careers. sims.give_satisfaction_points x Remove the word X with your desired value,this will give that particular sim satisfaction points. Download Sims 4 Cheats Codes from Below link.